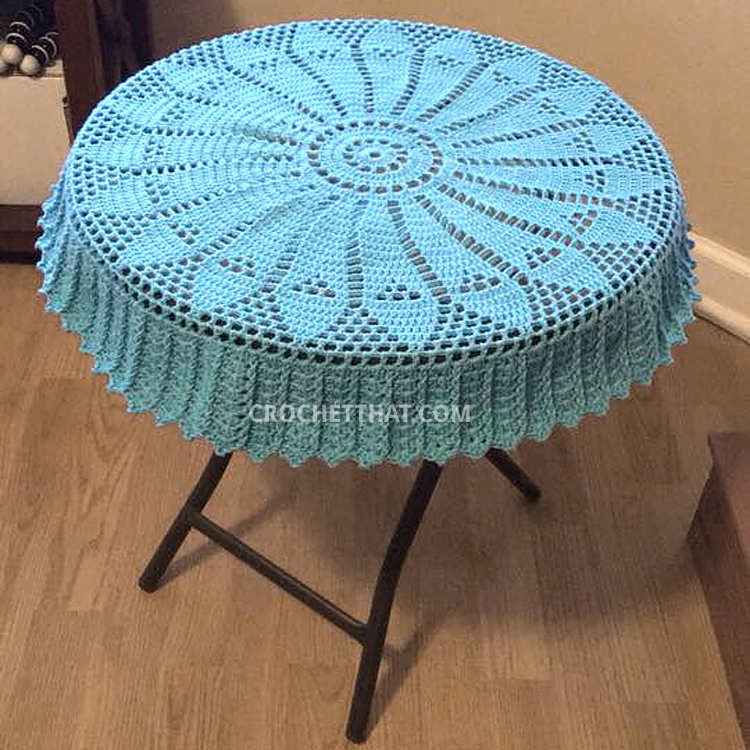 This Round Crochet Rug is beautiful and very easy to crochet. It is a bit time consuming but it didn’t take me more than a week to make. I think this rug would look great as an accent rug placed under a glass table on top of a colored rug. It would also make nice addition for a bathroom or sunroom. I found this crochet rug pattern on this blog but the language was Portuguese so I couldn’t read it. You may want to refer to her blog if you don’t like following written instructions because she includes a lot of great step-by-step graphics you can follow. I used the Google translator but it didn’t translate at all into English so I studied the photos she had on her blog and made up my own English version of the pattern. What I came up with is very close to her pattern but I cannot be sure it matches 100%. That is okay because it is still looks very nice the way I wrote it up. I suggest you block your finished rug or spray it with starch and iron it to make it lay flat. The edges tend to roll up a bit as you can see int the photo. I didn’t block or iron it before I took photos. Note: I am not a professional crochet pattern writer so please let me know if you see anything in the pattern that needs to be changed, fixed or clarified. 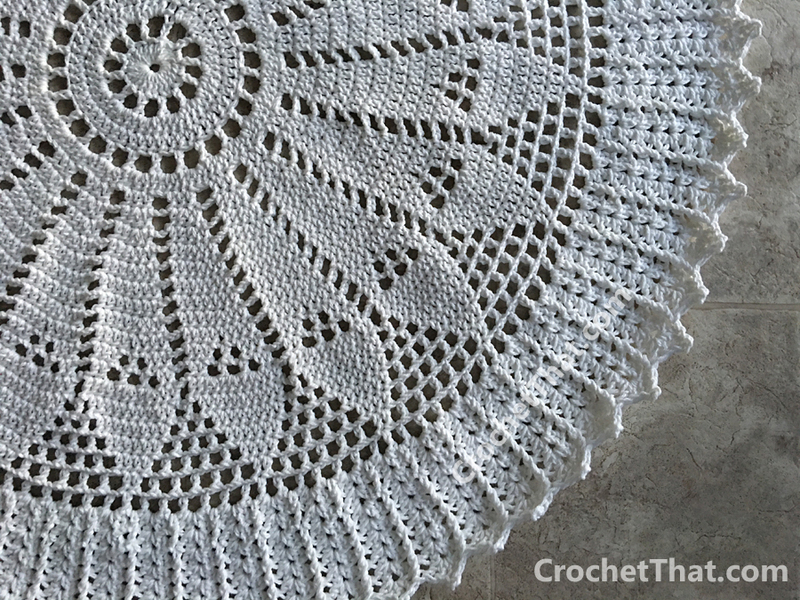 You could use this crochet pattern to make a doily if you use a smaller crochet hook and thinning yarn or make it into a rug using thicker yarn and a larger hook. I will leave the exact sizes I used for the doily and the rug below. Here is the finished doily. It fit perfectly on the round table I purchased from Walmart in the garden department. This table measures 17″ in diameter on the surface and the edges fanned out. I put my on it and the color even matches perfectly! Note: Chain 3 counts as first dc on the round. Round 2: Chain 6 (counts chain 3 and one dc); * skip 1 dc, dc in next dc; chain 3; repeat from * around; slst to 3rd chain of beginning chain 6. Round 5: Chain 6 (counts chain 3 and one dc); * skip 1 dc, dc in next dc; chain 3; repeat from * around; slst to 3rd chain of beginning chain 6. Round 6: Chain 3; * 3 dc in chain 3 space, dc in next dc; repeat from *; slst to top of beginning chain 3. (96 dc) Round 7: chain 3; 1 dc in next 2 dc; chain 3; * skip 2 dc; 1 dc in next 3 dc; chain 3; repeat from * around; slst to top of beginning chain 3. Round 9: chain 3; 1 dc in next dc, 2 dc in next dc, 1 dc in next dc; chain 3; skip 3 chains, * 1 dc in next dc, 2 dc in next dc, 1 dc in next 2 dc; chain 3; repeat from * around; slst to top of beginning chain 3. Round 10: chain 3; 1 dc in next dc, 2 dc in next dc, 1 dc in next 2 dc; chain 3; skip 3 chains, * 1 dc in next 2 dc, 2 dc in next dc, 1 dc in next 2 dc; chain 3; repeat from * around; slst to top of beginning chain 3. Round 11: chain 3; 1 dc in next dc, 2 dc in next dc, 1 dc in next 3 dc; chain 3; skip 3 chains, * 1 dc in next 2 dc, 2 dc in next dc, 1 dc in next 3 dc; chain 3; repeat from * around; slst to top of beginning chain 3. Round 12 & 13: chain 3; 1 dc in next 6 dc; chain 3; * 1 dc in next 7 dc; chain 3; repeat from * around; slst to top of beginning chain 3. Round 14: chain 3; 1 dc in next dc, 2 dc in next dc, 1 dc in next 4 dc; chain 3; skip 3 chains, * 1 dc in next 2 dc, 2 dc in next dc, 1 dc in next 4 dc; chain 3; repeat from * around; slst to top of beginning chain 3. Round 15 & 16: chain 3; 1 dc in next 7 dc; chain 3; * 1 dc in next 8 dc; chain 3; repeat from * around; slst to top of beginning chain 3. Round 17: chain 3; 1 dc in next 3 dc; chain 1, 1 dc in next 4 dc; chain 3; * 1 dc in next 4 dc, chain 1, 1 dc in next 4 dc, chain 3; repeat from * around; slst to top of beginning chain 3. Round 18: chain 3, 1 dc in next 2 dc, chain 2, skip 1 dc, 1 dc in chain 1 space, chain 2, skip 1 dc, 1 dc in next 3 dc, chain 3; * 1 dc in next 3 dc, chain 2, skip 1 dc, 1 dc in chain 1 space, chain 2, skip 1 dc, 1 dc in next 3 dc, chain 3; repeat from * around; slst to top of beginning chain 3. Round 19: chain 3, 1 dc in next dc, chain 2, skip dc, 1 dc in chain 2 space, chain 2, skip dc, 1 dc in chain 2 space, chain 2, skip dc, 1 dc in next 2 dc, chain 3; * 1 dc in next 2 dc, chain 2, skip dc, 1 dc in chain 2 space, chain 2, skip dc, 1 dc in chain 2 space, chain 2, skip dc, 1 dc in next 2 dc, chain 3; repeat from * around; slst to top of beginning chain 3. Round 20: chain 3, 1 dc in next dc, 2 dc in chain 2 space, 1 dc in next dc, 2 dc in chain 2 space, 1 dc in next dc, 2 dc in chain 2 space, 1 dc in next 2 dc, chain 3; * 1 dc in next 2 dc, 2 dc in chain 2 space, 1 dc in next dc, 2 dc in chain 2 space, 1 dc in next dc, 2 dc in chain 2 space, 1 dc in next 2 dc, chain 3; repeat from * around; slst to top of beginning chain 3. Round 21: slst to next dc, chain 3, 1 dc in next 9 dc, chain 2, 1 dc in chain 3 space, chain 2; * skip 1 dc, 1 dc in next 10 dc, chain 2, 1 dc in chain 3 space, chain 2; repeat from * around, slst to top of beginning chain 3. Round 22: slst to next dc, chain 3, 1 dc in next 7 dc, chain 2, skip next dc, dc in chain 2 space, chain 2; dc in chain 2 space, chain 2; * skip next dc, 1 dc in next 8 dc, chain 2, skip next dc, dc in chain 2 space, chain 2, dc in chain 2 space, chain 2; repeat from * around; slst to top of beginning chain 3. Round 23: slst to next dc, chain 3, 1 dc in next 5 dc, chain 2, skip next dc, dc in chain 2 space, chain 2, dc in next chain 2 space, chain 2, dc in next chain 2 space, chain 2; * skip 1 dc, 1 dc in next 6 dc, chain 2, skip next dc, dc in chain 2 space, chain 2, dc in next chain 2 space, chain 2, dc in next chain 2 space, chain 2; repeat from * around; slst to top of beginning chain 3. Round 24: slst to next dc, chain 3, 1 dc in next 3 dc, chain 2, skip next dc, dc in chain 2 space, chain 2, dc in next chain 2 space, chain 2, dc in next chain 2 space, chain 2, dc in next chain 2 space, chain 2; * skip 1 dc, 1 dc in next 4 dc, chain 2, skip next dc, dc in chain 2 space, chain 2, dc in next chain 2 space, chain 2, dc in next chain 2 space, chain 2; repeat from * around; slst to top of beginning chain 3. Round 25: slst to next dc, chain 3, 1 dc in next dc, chain 2, skip next dc, dc in chain 2 space, chain 2, dc in next chain 2 space, chain 2, dc in next chain 2 space, chain 2, dc in next chain 2 space, chain 2, dc in next chain 2 space, chain 2; * skip 1 dc, 1 dc in next 2 dc, chain 2, skip next dc, dc in chain 2 space, chain 2, dc in next chain 2 space, chain 2, dc in next chain 2 space, chain 2, dc in next chain 2 space, chain 2; repeat from * around; slst to top of beginning chain 3. Round 26: slst to next dc, chain 5, dc in chain 2 space, chain 2, dc in next chain 2 space, chain 2, dc in next chain 2 space, chain 2, dc in next chain 2 space, chain 2, dc in next chain 2 space, chain 2, dc in next chain 2 space, chain 2; * skip 1 dc, 1 dc in next dc, chain 2, skip next dc, dc in chain 2 space, chain 2, dc in next chain 2 space, chain 2, dc in next chain 2 space, chain 2, dc in next chain 2 space, chain 2, dc in next chain 2 space, chain 2; repeat from * around; slst to the third chain of the beginning chain 5. Your piece may not lay completely flat at this point. The next row will even it out and it should lay straight after you complete row 27. Round 27: slst into chain 2 space, chain 3, 1 dc, chain 1, 2 dc in same space, dc in next chain 2 space; * 2 dc, chain 1, 2 dc in next chain 2 space, dc in next chain 2 space; repeat from * around, slst to top of beginning chain 3. Making the Raised Ridges: the next row, and remaining 6 rows, will create the nice raised ridges around the edge. I couldn’t translate the name of the stitch so I am calling it a twisted dc. It’s a bit tricky the first time you do it, but once you learn how to do it, you’ll find it easy. I made this very short (32 second) video to show you how to make the twisted dc and also the slst to the last cluster on the last row to finish off the rug. I am left-handed so the video is done with my left hand. 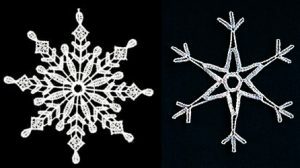 I could not figure out how to make it for right-handed crocheters, sorry. To make the twisted dc, yarn over the hook, put the hook in the opening in front of the single dc, bring it behind the dc, and up through the opposite opening to the front, yarn over, pull through 2 loops, yarn over, pull through 2 remaining loops. Round 28: slst in the next dc, slst into the chain 1 space, chain 3, 1 dc into the chain 2 space, chain 1, 2 dc in same chain 2 space, make a twisted dc around the next single dc from previous row; * 2 dc, chain 1, 2 dc, in next chain 1 space between the 2 dc of previous row, make a twisted dc around the next single dc from previous row; repeat from * around; slst to top of the beginning chain 3. Round 29-34: slst to next dc, slst into the chain 1 space, chain 3, 1 dc into the chain 2 space, chain 1, 2 dc in same chain 2 space, make a twisted dc around the next single dc from previous row; * 2 dc, chain 1, 2 dc, in next chain 1 space between the 2 dc of previous row, make a twisted dc around the next single dc from previous row; repeat from * around; slst to base of the beginning chain 3. Round 35: slst in the next dc and then into the chain 2 space, chain 3, 1 dc into the chain 2 space, chain 3, slst to top loop of previous dc, 2 dc into the chain 2 space again (this makes the point), make a twisted dc around the twisted dc from previous row; * 2 dc in next chain 2 space, chain 3, slst to top loop of previous dc, 2 dc into the chain 2 space again, make a twisted dc around the twisted dc from the previous row; repeat from * around; slst to the base of the beginning chain 3, not top of chain 3. Fasten off. Hi. Beautiful rug. Thanks your pattern is very good. I am so happy. Those are beautiful!! When it said “sunflower” I had to look to see what it was lol…I am left handed also,so the video will be great to watch..thank you! !